Transform your bass into one of 11 superb-sounding synths, thanks to the new Electro Harmonix Bass Mono Synth pedal! With it's choice o..
Transform your bass into one of 11 superb-sounding synths, thanks to the new Electro Harmonix Bass Mono Synth pedal! 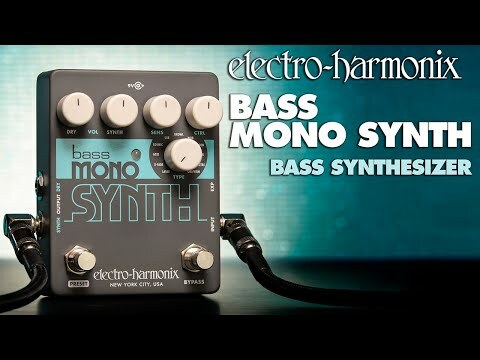 With it's choice of sounds ranging from vintage synth emulation, to thick, stacked voices and much more besides, the Electro Harmonix Bass Mono Synth allows for fully expressive playing, and it won't cost you a fortune either. This fun little stompbox allows you to dial in your ideal synth sound with ease, and even allows you to to save and recall presets for each of the eleven built-in synth sounds. Thanks to the straightforward control parameters, fine-tuning each of the preset types couldn't be easier. First of all, you get Volume controls for both the Dry and Synth signals, which allows you to choose just how much of each signal is present at the Synth Output. If you'd like the signal to be all-synth with no clean bass, then have Dry set to 0 and adjust Synth accordingly. Don't be confused by the Dry output socket - this isn't affected by the Dry volume control and is simply there to send a buffered, unaltered Dry signal through to either a second amp, or a mixing desk. Secondly, you have the Sens control (aka Sensitivity) which adjusts the input signal's gain before it gets to the Synth trigger block. This allows you to adjust the Bass Mono Synth based on how dynamic your playing is. The on-board LED lights orannge when the input signal exceeds -4.6dB, and can be used as an indicator for where your Sens control should be set. If the LED lights up only on your loudest playing, then all should be fine, but if it happens when you're playing quietly you might wish to lower the sensitivity. And likewise, if some of your notes fail to trigger the synth effect and you want them to, simply increase the Sens control until they do. Thanks to the Preset footswitch you can toggle between the voice's Preset and a live WYSIWYG (What You See Is What You Get) mode. Once you've got the parameters set up as you want them simply press and hold the Preset switch for approximately 2 seconds, until the LED blinks red, and then release. To recall the preset, assuming you're in Live WYSIWYG mode and the LED is green, simply change the voice control to the one you want, and press the Preset switch. If you want to switch to another preset voice once in this mode, simply adjust the voice name and it's preset will automatically load up. If you'd like to go back to Live mode, just press and release the Preset switch once more and the LED will change back to green. Each of the voices on the EHX Bass Mono Synth has parameters than can be controlled via external expression pedal. Control everything from filter resonance, pitch modulation depth, cutoff frequencies, and even envelope sweep depth, depending on which voice you have selected. Keep your eyes peeled for the Electro Harmonix Bass Mono Synth landing at a Professional Music Technology store near you soon, and be sure to request an in-store demonstration - you won't regret it!